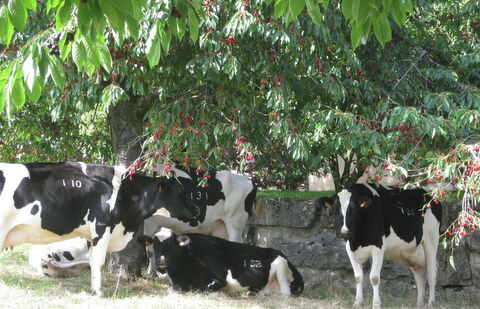 Our local cherry trees are loaded with fruit and the cows currently on maternity leave in the nextdoor field are sheltering gratefully beneath their leafy branches (probably pinching a few cherries too). Time for clafoutis, a gorgeous baked cherry pancake. Dust it with icing sugar and serve it warm. A little vanilla ice cream doesn’t go amiss. 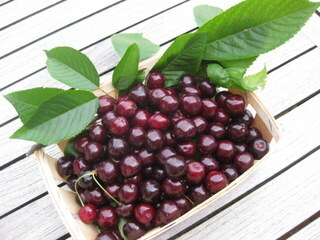 PS: A note on cherry-stoning (from my book A Taste of Switzerland, published by Bergli Books): if you’re planning to do a lot of cherry-stoning, you can invest in a nifty Swiss-made device, which is fixed to the kitchen table by the turn of a screw. You drop the de-stalked cherries into the jaws of the device, and they’re funnelled inexorably down a slippery slope into a sort of trap. By means of a short karate chop to the lever, the stone is blasted out one way, the fruit the other. There’s also a liberal spattering of juice, so equip yourself with a capacious apron (or do this operation in a bathing suit, preferably a cherry-coloured one, out on the terrace/in the garden). The economical Swiss even find a use for the stones: after they are cleaned and dried, the stones are pressed into service as a weight for blind-baking pastry cases. They’re also used to fill rough little hessian bags marked Chirsisteine, which are full of rattling cherry stones – before the advent of central heating (or even hot water bottles), the bag would be placed last thing at night in the residual heat of the wood-burning stove, and later into the bed to warm it up.